I am playing the electric guitar since my early years, so I've already tried many amps over my nearly life-spanning career as a musician. 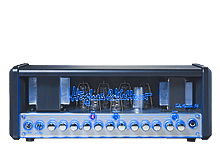 The Hughes & Kettner TubeMeister 36 has certainly convinced me immediately within the first seconds as I powered it up. A strong fellow, especially when combined with my Gibson Les Paul. Whether on a straight rock or metal riff, whether in the studio or on sweaty gigs. This amp combines compactness, precision and power, wrapped in an absolutely distinctive design! This thing rocks the hell out of your axe!!! Florian Breitwieser is a guitar player since his youngest childhood and founder of Austria’s most recognizable modern metal band Cannonball Ride. Coming from different music genres like punkrock, metalcore and deathmetal, Cannonball Ride was formed by five guys from Upper-Austria in ´09. The band is well appreciated mainly because of their extraordinary guitar playing and their complex songwriting in which they combine both rock and metal elements in a very unique way. Over the years they developed a convincing and professional live performance and are in the position to look back to over 300 live shows all across Europe. During the past, they had the chance to share the stage with bands like Korn, Deftones, Hatebreed, Napalm Death, Dog Eat Dog, Stick To Your Guns, Kvelertak, Caliban, The Ghost Inside, Arch Enemy and many more. The physical output of Cannonball Ride so far includes their debut EP "Breaking Walls And Building Bridges" (2009) and "Enchant The Flame And Let It Breathe" (2011). The next step has been reached with debut album "Emerge&See" (2014, to reach its highest Austrian Longplay Charts peak in #44). Single-Output "Ariadne" reached #62 in the Austrian Single Charts. Cannonball Ride is definitely climbing up the ladder with this statement and prove themselves constantly evolving.